Another day, another SingStar game. Your apathy is understandable. But wait! Even the bloodiest of red-blooded males may find this one to be of interest. Why? Because it's Queen. As far as strutting, pour-your-heart-out rock goes, it doesn't get much bigger than Queen. Which means when your girlfriend/lady friend/wife/sister says "oh go on, have a go", your usual excuse of "nah, this is all girly tripe" just won't cut it. Why? Because it's Queen. You're just going to have to man up. Variety: A big part of not just Queen's popularity, but also their longevity, is that the band's catalogue is so wildly eclectic. Pop, ballads, hard rock, most people's genre of choice will be covered, which for a party game is crucial. Indeed, in my humble opinion, the SingStar Queen tracklist is more varied – and more enjoyable – than the remainder of the SingStore itself can manage. Princes of the Universe: The whole point of these music games is that they should make you feel big. Like a rock star. SingStar Queen nails this. Sure, that has more to do with the fact it's Queen than with the game itself, but if you don't break into a massive grin after singing "Bohemian Rhapsody" there's something inhuman about you. Inequality: The game is available on both PS2 and PS3. The PS3 version contains 25 songs, but the PS2 version only has 20. This is no doubt down to size restrictions, as other SingStar titles available on both platforms have featured the same discrepancy, but still. It's a little unfair on PS2 owners, who are no doubt still the most numerous purchasers of the series. Under Pressure: This one isn't really the game's fault either, but you can't help playing through SingStar Queen's tracklist and wishing it was Rock Band: Queen's tracklist instead. Being the umpteenth release of a well-worn, successful franchise, there's really not much more to say. This is SingStar, only instead of corny pop songs, it's a collection of classic rock tracks. Your mileage on this will depend entirely on how comfortable you are singing in public, and how much you enjoy Queen. 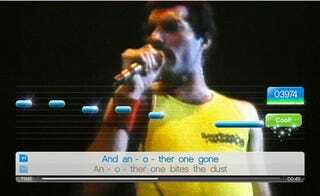 SingStar Queen was released in the United States on August 4 for the PlayStation 2 and PlayStation 3. Developed by London Studio, published by Sony Computer Entertainment. Retails for $40 on PlayStation 3 (UK version reviewed), $30 on PlayStation 2. Played every song in multiplayer mode, most songs - shamefully - in single player.